Central Carolina Community College has selected 10 Student Ambassadors to serve during the 2013-14 academic year. Ambassadors represent the college at special events on campus and in the community. 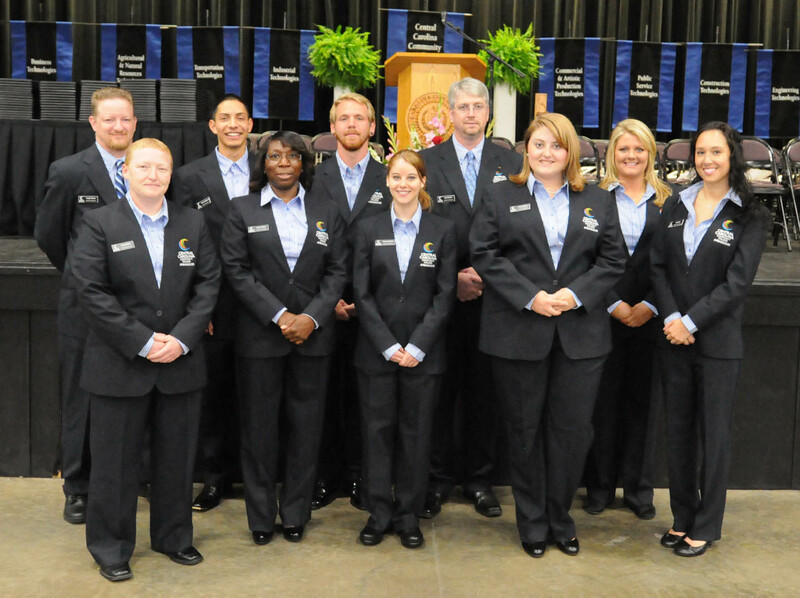 Pictured (front, from left) by name, town and major, are Amanda Eury, Spring Lake, Computer Information Technology; Koren Hailey, Angier, Criminal Justice; Kristen Shreiner, Sanford, Veterinary Medical Technology;	Mary Cooper, Sanford, Associate in Arts; Holly Sears, Sanford, Industrial Systems Technology; and Leela Rao, Sanford, VMT; and (back, from left) Joseph Dwyer, Cameron, CIT; Hamlet Valladares, Sanford, Electrical Engineering; Travis Sholder, Lillington, Sustainable Technologies; and Scott Butcher, New Hill, Industrial Systems/Bio-Process. Students are nominated to be Ambassadors by college faculty and staff based on leadership potential, communication skills and academic performance. Ambassadors give three to five hours of service per week to the college. They must attend 80 percent of all classes and group meetings, have good standing in the community and college, maintain a 3.0 cumulative grade-point average, complete a summer honors leadership course, attend called and mandatory events, and participate in a minimum of three public speaking engagements. For their service, Ambassador receive free tuition and fees. For more information about the program, contact Student Activities Director Mike Neal, the Student Ambassador coordinator, at mneal@cccc.edu or 919-718-7337.